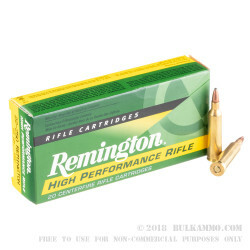 Make varmint hunting into a real life game of long range Whack-A-Mole with these 55 grain soft point .22-250 rounds from Remington! 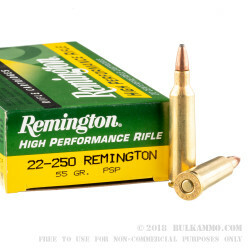 Varmint hunting is one of the most popular types of hunting in the US, and these .22-250 rounds with a pointed soft point are an excellent choice for that pursuit. Whether it’s shooting prairie dogs in Wyoming or coyote hunting in Nevada, these 55 grain soft points are going to get the job done. Expect a muzzle velocity of more than 3700 feet per second along with devastating energy when you’re hunting varmints. 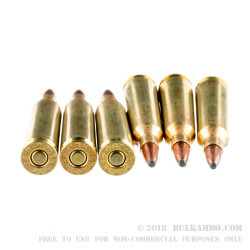 The pointed soft point bullet is designed to mushroom on impact, maximizing the effectiveness of this .22-250 ammo and ensuring a clean, humane kill. The projectile is loaded into new manufactured brass cases with boxer primers, making the cases fully reloadable. But we’d suggest reloading won’t be necessary due to the cheap price! 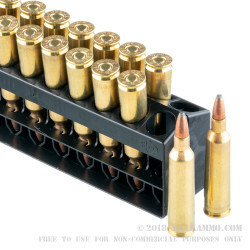 These excellent varmint hunting ammo in .22-250 are are packed and shipped in individual boxes of 20, with each box containing a plastic insert to keep the rounds upright and safe during shipping.